After a lot of data cleaning and number crunching, we are able to present the following three maps of the geographies of Wikipedia in the UK using brand new November 2010 data. 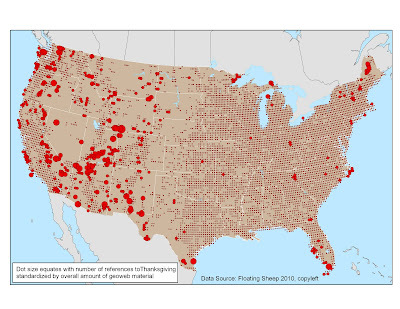 Looking at the first map (total number of articles in each district), we see some interesting patterns. With a few exceptions, it is rural districts in Scotland, Wales and the North of England that are characterised by the highest density of articles. What we're likely picking up on is the fact that large districts simply have more potential stuff to write about. 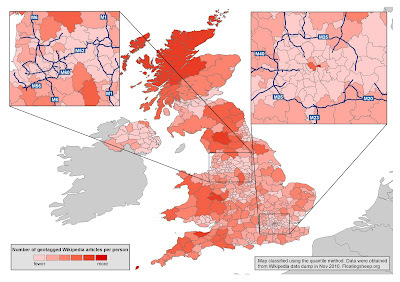 If we normalise the map by area we see an entirely different pattern. The map below displays the number of articles per square KM. 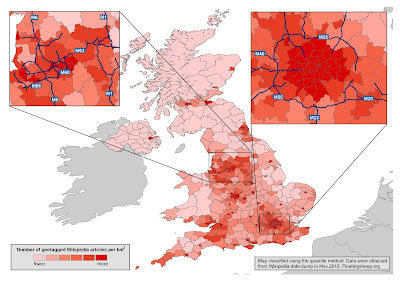 We see that most of the large urban conurbations in the UK are covered by a dense layer of articles. Most sparsely populated areas in contrast have a much thinner layer of virtual representation in Wikipedia. There are, however, some notable exceptions. Parts of Cornwall, Somerset and the Isle of Wight all have a denser layer of content than might be expected for such relatively rural parts of the country. On the other hand, one might expect a higher density in the districts surrounding Belfast (in fact almost all of Northern Ireland is characterised by very low levels of content per square KM). Here some more surprising results are visible. All major urban areas have relatively low counts of article per person (with the exception of central London). In contrast, many rural areas (particularly areas containing national parks) have high counts per person. There are obviously a range of ways to measure the geographies of Wikipedia in the UK. We see that some areas are blanketed by a highly dense layer of virtual content (e.g. central London and many of the UK's other major conurbations). These maps also highlight the fact that some parts of the UK are characterised by a paucity of content irrespective of the ways in which the data are normalised. Northern Ireland in particular stands out in this respect. 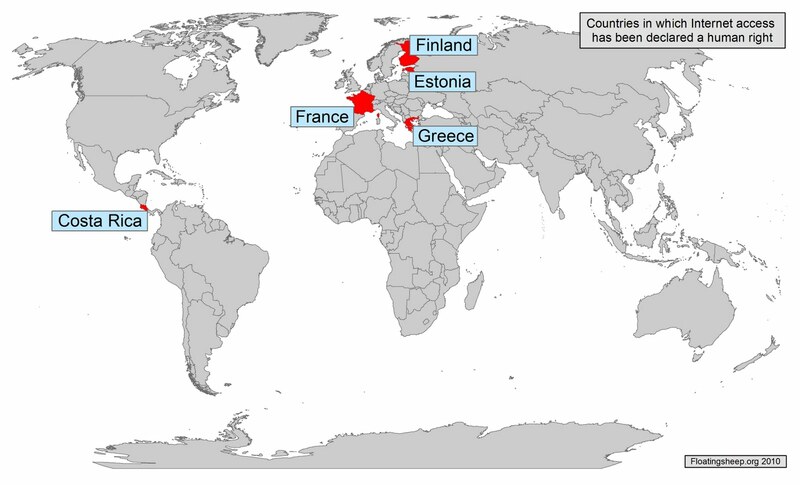 We'll attempt to upload similar analyses of other countries in the next few months. In the meantime, however, we would welcome any thoughts on the uneven amount of virtual representation that blankets the UK. p.s. many thanks to Adham Tamer for his help with the data extraction. It is likely that there will soon be other additions to this list. There is a strong push for universal internet access by major international organisations. The secretary-general of the ITU, for example, stated that governments should "regard the internet as basic infrastructure - just like roads, waste, and water." A recent BBC World Service poll found that 79% of people, in a poll of 27,000 people conducted across 26 countries, consider internet access to be a fundamental right. However, our representatives clearly remain more sceptical about codifying human rights. This extends to more than just internet access. For instance, last July the United Nations even passed a resolution recognizing that access to clean water was a human right: 122 countries voted in favor, while 41 abstained (including the U.S.) . It will therefore be interesting to see how this map changes over the next few years. Please provide feedback on any changes that should be made to this list. Multiple posts (here and here) from last week documented the strange disappearance of the University of Kentucky label from the Google Maps based layer. Making it more intriguing was that the University was re-labeled as Transylvania University (see image below). The mis-labeling seems to have been fixed (actually as we were posting last Friday). We're not privy to the how and why (we didn't report the error and Google generally doesn't comment) but we can take comfort in the fact that at least the city of Lexington didn't get renamed as has happened elsewhere. Further exploration, however, has revealed that labeling is apparently a matter of scale (Update: at least some of the time). 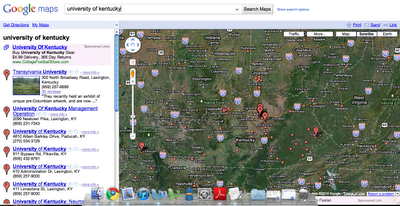 Or in Google Maps terminology, as zoom level changes, the labeling for the University of Kentucky changes as well. At Zoom Level 12, the area for the University of Kentucky is shaded differently but no labels are shown. At Zoom Level 13, the area is labeled as the University of Kentucky. (Update: Or at least it did when we did this at 1:15 pm on 11/11/2010. As of 2:00 pm on 11/11/2010 Zoom Level 13 shows Transylvania University. See screenshots below.). At Zoom Level 14 (and higher), the area is labeled as Transylvania University. 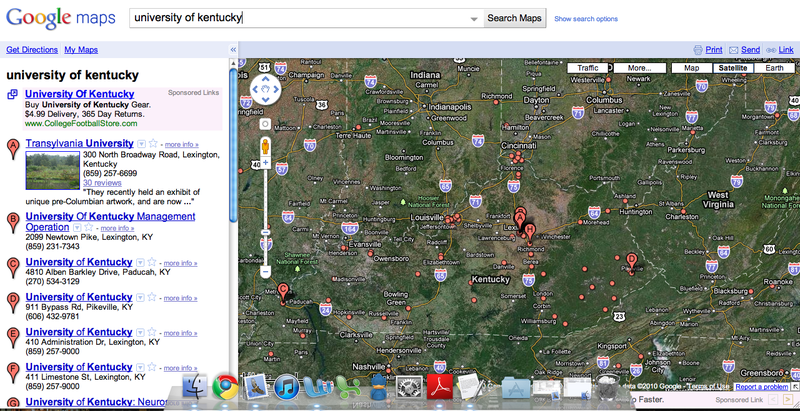 2nd Update: As of 4:00 pm on 11/11/2010 the University of Kentucky label was showing up all zoom levels from 13 up. But there were still Transy references, see figure below. The links above showed this change when we posted on 11/11/2010 but since the base map will change, static screen shots of the different zoom levels are below. The Manchester Derby, a heated football game between Manchester City and Manchester United, has been hotly contested since 1881. United have recorded the most wins overall, and indeed the most success in general. However, City recently (by some measures) became the world's richest sports team and have invested heavily in order to become outdo their local rivals. But how has this rivalry taken form online? Has the new found wealth (and relative success) of Manchester City given the team more visibility than their more successful rivals? 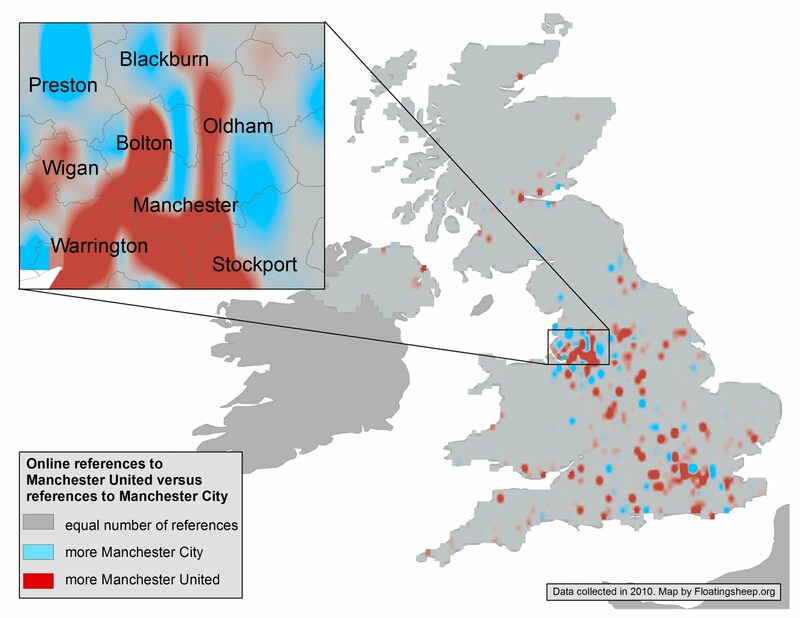 And, is the commonly repeated assertion that City fans are from Manchester, but United fans are from elsewhere reflected in online visibility for the two clubs? 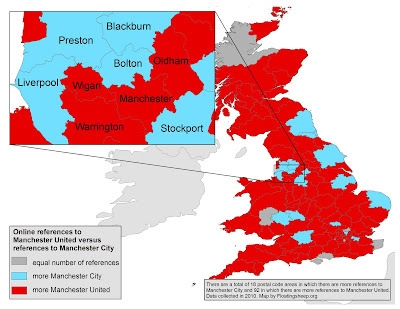 The maps show that within Britain, Manchester United are far more visible than Manchester City. There are only 18 postal code areas in which there are more references to City than United, but 92 in which the opposite is true. The main cluster of areas in which City outdo United are unsurprisingly located in the Northwest, but interestingly within Manchester itself it is United and not City that are characterised by the greater degree of online visibility. So, at least in online world, it remains that Manchester City can't quite yet claim to be the only real representatives of Manchester. As we noted in our last post, Google Maps lists the the University of Kentucky as Transylvania University (an actual university, also located in Lexington). It is apparently located at a McDonalds on the edge of town. This image is based on a search conducted on 11/8/2010 via Internet Explorer at the default North American opening screen with a clear cache and no cookies from an office within the University of Kentucky. The actual main campus of the University of Kentucky. This image is based on a search conducted on 11/8/2010 via Internet Explorer via the wireless service at the University of Kentucky. Did Nicaragua Really Invade Costa Rica because of Google Maps? An interesting article about the power of maps. As the story is reported, Nicaraguan troops mistakenly entered Costa Rican territory because of the placement of the border on Google Maps. I'm a bit suspicious, as it seems likely that officials in the area would have a good sense of where the lines of a disputed border were. Using a Google Maps border, particularly with low resolution data, seems more like a cover story than something that might actually happen. But who knows? Thanks to Zach Underwood in passing this along. In any case it again highlights the power of maps in general and Google Maps in particular. Google has no official standing in terms of recording international borders or naming but exerts a tremendous amount of power, nonetheless. In a much more prosaic example, the University of Kentucky has been listed as Transylvania University (an actual university, also located in Lexington) for a least ten days. A static image is below, or you can go directly to Google Maps (which may change). I will state for the record that Floatingsheep was NOT involved in this little map hack, we just happened to notice it ten days ago. We prefer that you not try to fix as we're curious how long it will remain. There was an interesting piece in the Guardian recently by Micah White with the provocative title, "Google is polluting the internet". (Thanks to Martin Dodge who sent it to me.) It basically comes down to an analysis of the political economy of knowledge classification in the age of Google searching. How do we relate things together? And most crucially, how does advertising (Google's revenue source) influence what we find and what we chose to pursue? 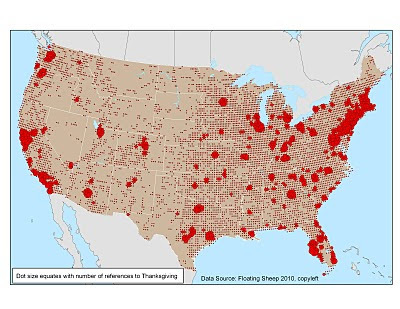 Food for thought and similar to many of the issues that we regularly raise here in regards to how sorting of maps (including advertisements) shapes our understanding of places. We generally think of ourselves as sophisticated users of technologies but we are not immune; advertising links on our smartphones have changed our decisions about where to go. There is no one right answer to how to search and map, just as there is not one truly representational map. The decisions that are made are necessary for things to work but they are decisions rather than simply value-neutral operations and warrant thoughtful consideration. As this article notes, "There is no system for organising knowledge that does not carry with it social, political and cultural consequences. Nor is an entirely unbiased organising principle possible. The trouble is that too few people realise this today. We've grown complacent as researchers; lazy as thinkers. We place too much trust in one company, a corporate advertising agency, and a single way of organising knowledge, automated keyword indexing." Introna and Nissenbaum have a good article on this for those who are interested (see below). I'd welcome any other suggestions as well.